Since so many of our guests make their Oktoberfest reservations a year in advance, we like to send them reminder letters. The reminders will go out this weekend. 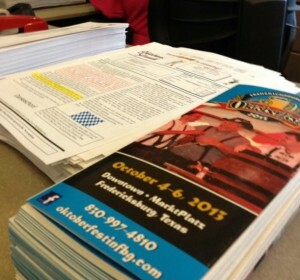 So if you have a reservation us at Oktoberfest, look for an envelope from us in your mailbox. We’re including the entertainment list for the weekend. Don’t forget that our app, for both iOS and Android, can give you turn by turn directions to all the activities going on that weekend and to select restaurants and shops! Prosit! and see you in 35 days!